The word stoma comes from the Greek word meaning mouth or opening. 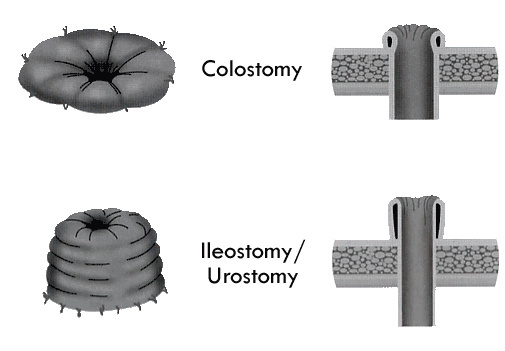 There are many kinds of stoma but the main ones described here are colostomy, ileostomy and urostomy (ileal conduit). A stoma is a surgically created abdominal opening to which part of the bowel is attached. The stoma has no nerve supply so should not be painful but as a result it can not be voluntarily controlled, which means a pouch or bag must be worn to collect the urine or bowel contents (faeces). Each persons stoma is different and will probably be swollen immediately after surgery, though this will shrink over the next few weeks. It is normally red in colour, similar to the inside of your mouth, and can bleed easily, especially if handled roughly. This type of bleeding is normal but if it continues you should contact your stoma care nurse or doctor. How often you change your stoma pouch will depend upon the type of stoma and pouch you use. One of the most imporant things to remember is to take good care of the skin around the stoma. In practice, a stoma requires the same hygiene as an ordinary toilet visit. If the pouch is applied and managed correctly there should be no odour or leakage. As with any surgery you will need time to recover which can take up to a few months. Having a stoma involves adjustment and learning new habits and although this can seem unpleasant and difficult in the beginning, it can, with time, become a natural part of your daily routine. The information given in this webiste is very broad so please contact your local Stoma/Colorectal nurse if you want any further information. There are also many voluntary groups and associations for people with stomas who would be happy to help you. Please click on the links for a list.